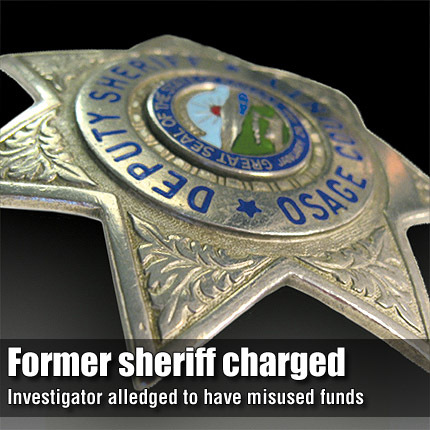 LYNDON—A former Osage County Sheriff’s narcotics investigator appeared in Osage County District Court last week, answering a summons on a charge of misuse of public funds. The complaint against Shane B. Kirkpatrick, filed Aug. 18, was made public last week following Kirkpatrick’s appearance in court. The charge alleges Kirkpatrick unlawfully and knowingly used public money, less than $1,000, in a manner not authorized by law. The complaint alleges the crime happened March 27. The alleged crime is a class A nonperson misdemeanor. An offense report obtained from the Kansas attorney general’s office was filed March 30 by Osage County Sheriff Laurie Dunn. The report showed Dunn as the reporting person and Osage County as the victim. The report described the property lost in the crime as “money, bills” valued at $450. The report said the incident happened at 131 W. 14th St., in Lyndon, the address of the sheriff’s office. Kirkpatrick’s resignation from the sheriff’s office was accepted by the Osage County Commission April 1. Contacted Friday, Osage County Attorney Brandon Jones said the attorney general’s office was prosecuting the case due to Jones’ role in representing the legal interests of the county.